Our fight to Darwin was on a full-sized plane with just 17 passengers so it didn’t take long for inflight service to be completed, then the crew took their seats for the rest of the flight! We arrived at about 21.00, went straight to the hotel and checked in. Next morning we were picked up at 06.00 for a three-day trip to Kakadu National Park and Katherine Gorge, it was still dark when we left the city, we hadn’t seen Darwin in daylight! Kakadu National Park is about 4 hours east of Darwin, it is the most diverse national park in Australia and we had two days to explore it. After a couple of hours we stopped at a road house for breakfast and then headed for Jabiru airport where five of our group (we were 14 in total) had booked a scenic flight over the park. 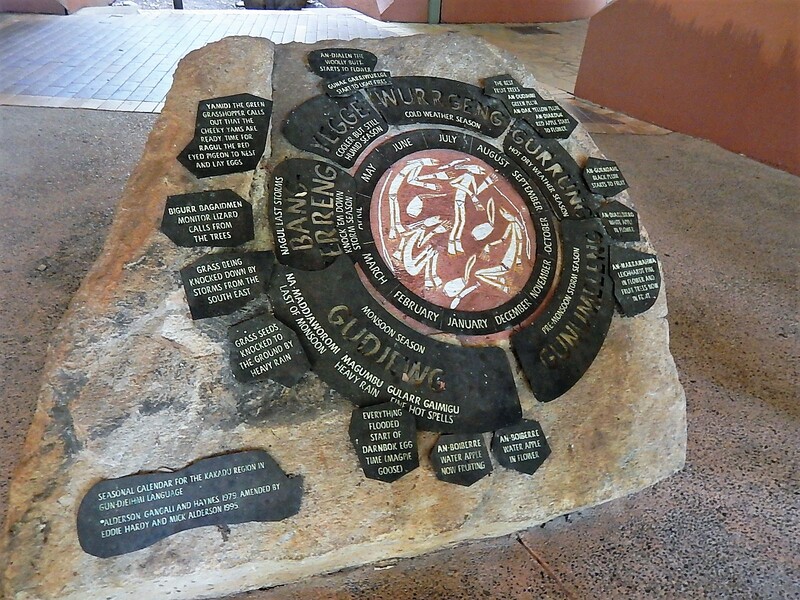 The rest of us went on to visit the Warradjan Cultural Centre to view displays depicting the traditions of the Aboriginal people in Kakadu. The group met up again at the Yellow Water billabong for a cruise on the waterway. 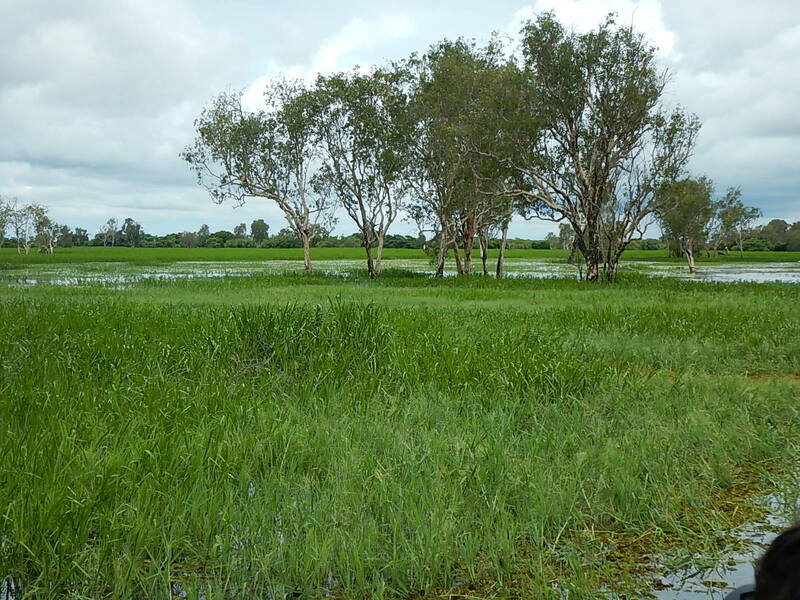 A billabong is a deep section of river which holds water through the dry season; our visit coincided with the beginning of the wet season after an already wet winter so the water levels were high, the river was full and had burst its banks flooding water meadows for miles in all directions. This cruise in a small, flat bottomed, steel boat turned out to be one of the highlights of time in Australia, it was beautiful. We started out from a landing stage on the river bank, our aborigine guide (wearing a Santa hat) took us down river then through a wooded billabong where he picked a route between mangrove trees, all the time we were watching out for crocodiles but we didn’t spot one, they tend to wander off when the water levels allow them to. After about 30 minutes we left the billabong and emerged into a flooded landscape much like a tropical version of Wicked Fen near Ely! The land was covered in lush bright green grass as far as the eye could see, it was broken up here and there by swathes of water lilies. 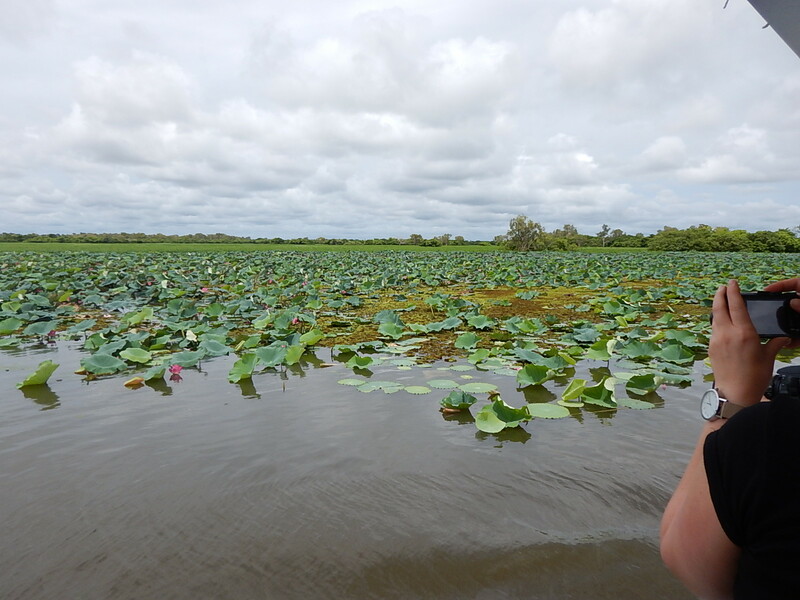 As we cruised quietly along the waterways we saw sea eagles and wading birds, and our guide pointed out different plants that his community forage for food and for medicinal use. He told us more about his clan’s traditional way of life hunting, fishing and foraging. He told us that while he likes eating wallaby he won’t hunt them because his mum thinks they are cute! The cruise lasted about 2 hours and was just fabulous. 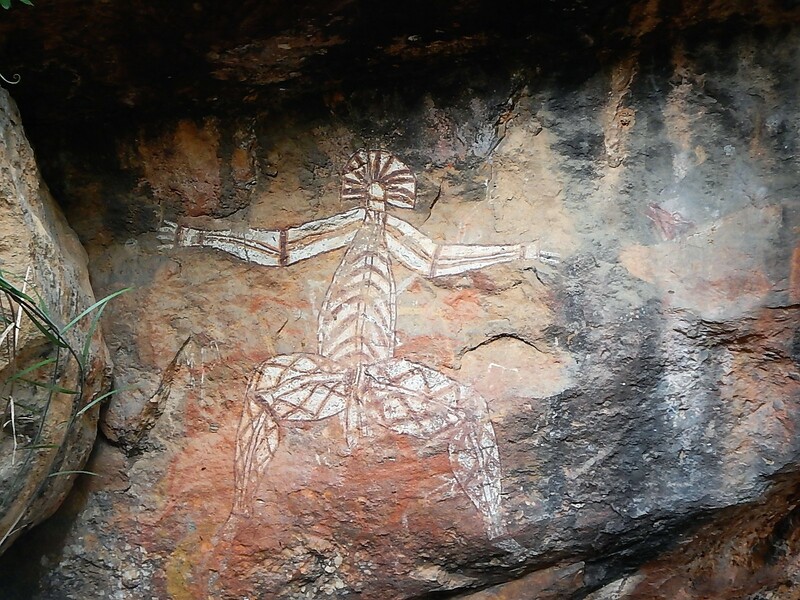 After that we stopped at a visitor centre for lunch and then took a guided walk to Nouralangie Rock to view ancient rock art. Kakadu is famous for its rock art sites, these ancient paintings (some are estimated to be over 20,000 years old) tell a mixture of creation stories, which are used to educate children about how to behave and survive in the bush; and practical information for other travellers sharing information on fish and game in the area and other information. One picture showed a stick figure with swollen joints, this was to warn visitors that there was poison in the area, local clans had realised they got ill when they spent too much time in that spot, their joints would swell and they would have stomach problems, the drawings warn other people not to stay to long. 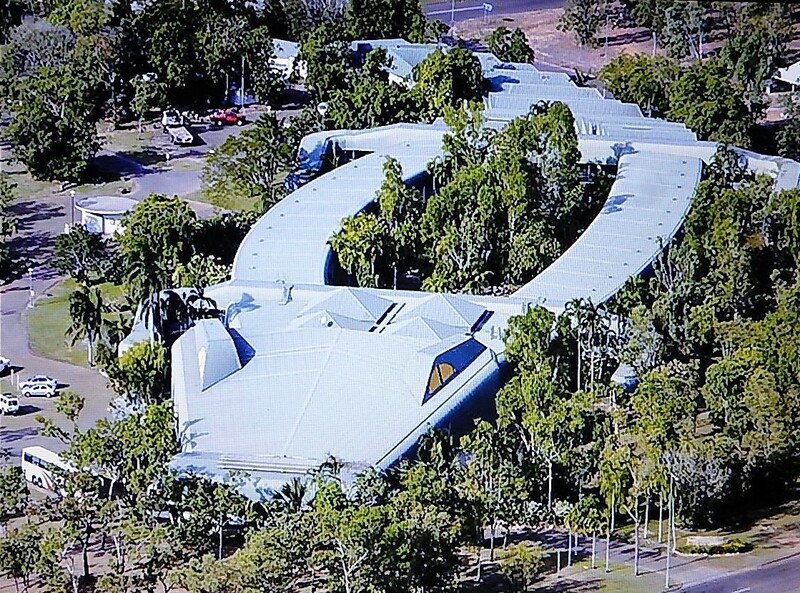 We spent the night at the Kakadu Crocodile hotel near Jabiru, the hotel is built in the shape of a crocodile, you walk into the mouth to reach reception and our room was in the ribs just behind the front leg/staircase to the first floor! Next morning we set of for our second day in Kakadu. First stop was Ubirr, a rock escarpment with a fabulous 360⁰ lookout at the top. It was a bit of a clamber to get to the top but it was well worth it. On the way up we saw more examples of rock art; some of them were high up well beyond where anyone could reach to paint, the local clans attribute these paintings to spirits, our guide explained that over 1000’s of years the rock had eroded and ground level is now several meters lower than it would have been – you choose which explanation to believe. At the top we had amazing views out across the floodplains in one direction, an in the other we could see across to Arnhem land. Arnhem land is a vast area of the Northern Territory which is reserved for aboriginal communities to live a traditional life, it is closed to all other visitors without express permission to visit, and is not subject to Australian law, it is governed according to traditional aboriginal social rules. Most of the wilderness and national park territory we have visited belongs to Aboriginal groups, they secured ownership under hard-won land rights legislation, most of it is leased back to the government and run by management boards with typically 10 aboriginal representatives, two government reps, an environmentalist and a tourism expert, together they manage the land. One traditional land management technique which was first abandoned by government managers (before the land was returned to the traditional owners) is controlled burning. This practice was stopped by the government as destructive but, as the local people quickly pointed out the land deteriorated quickly becoming overgrown and infertile and experiencing severe bush fires. The traditional practice was to regularly carry out controlled burning to clear out dry grass and dead wood. This removes material that could fuel a bush fire during the dry season, improves fertility and encourages new growth, the trees in the savannah woodlands have evolved to survive fire. The practice has been readopted, fires are lit in late afternoon during the early part of the wet season, this means they burn low and moisture in the air puts them out overnight. While they burn aboriginal people and birds of prey wait on the edges and catch animals and lizards that escape the burning ground. Some hawks have been observed picking up burning embers from the fire as it dies down, taking them somewhere else and dropping them to start a new fire and flush out more prey – very clever! We have learned quite a lot about Australian wildlife during our travels; we have learned to tell the difference between a Wasaroo (dead, usually on the side of the road) and an Isaroo (alive) and can differentiate between a Logodile and a Crocodile. Who needs David Attenborough? After Ubirr we headed for the misnamed Alligator river (there aren’t any alligators in Australia, just crocodiles) and boarded another boat for a ‘jumping crocodile’ cruise, we were a bit wary about this, we aren’t generally too keen on tourist attractions that exploit wild animals but the crew on the boat spoke very knowledgeably about the crocodiles and their welfare and are involved in a lot of research and conservation work so we were reassured that the crocodiles were being protected. As we cruised up river a crew member on the top deck hung small chunks of raw meat overboard on a long pole, we watched as crocodiles swam out from the bank and then leapt out of the water to grab the meat. They were made to work for the meat, jumping several times before they were allowed to catch it, this simulates the energy expended hunting and ensure they don’t get fat of free treats. 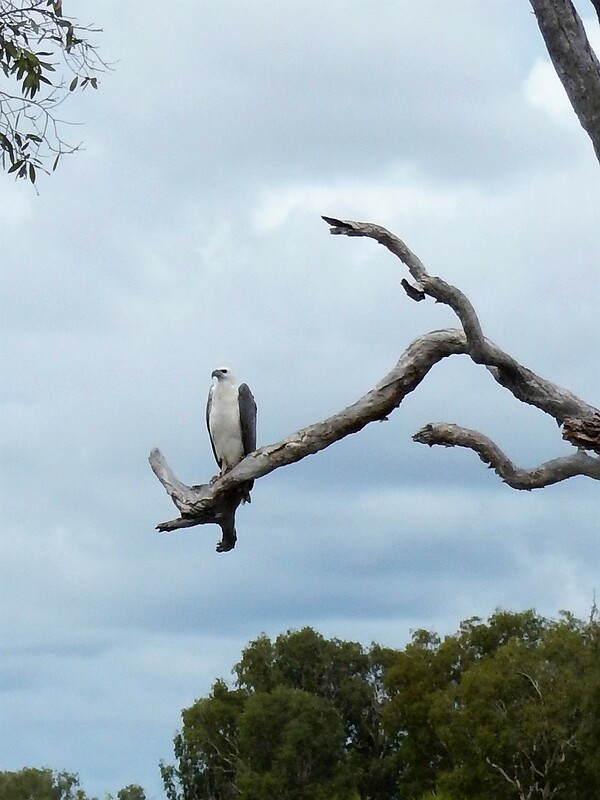 As we cruised back to the jetty a flock of 12 or more Australian Kites appeared, the crew threw small pieces of meat from the boat and the Kites caught them in mid-air; we also saw a wild sea eagle take a piece of meat from the pole – what a show! In the dry season the second night of the trip would have been spent in Katherine, three hours south-west of Darwin, however in the wet season the roads become impassable so we returned to Darwin for the night arriving after dark and, you’ve guessed it, leaving before sunrise! On arrival we heard that Darwin had 123mm (5 inches) of rain while we were away. Day three began with a stop at the Adelaide River war cemetery, maintained by the Commonwealth War Graves Commission this small cemetery contains graves of soldiers and some civilians killed in the WWII bombing of Darwin. It was a beautiful, peaceful spot with manicured lawns and immaculate borders and dozens of Wallabies. Onwards to another road house for breakfast, and then to Edith Falls, a picturesque waterhole with a powerful waterfall pouring into it from the rocks. After lunch we picked up another small, flat bottomed boat for a cruise through Katherine Gorge, a very impressive gorge carved through red sandstone over millions of years. Half way down the gorge the river was blocked by some rapids, we had to climb over rocks and follow a short path to reach a second boat which took us the rest of the way through the Gorge, on the way back we did the same in reverse. Finally we returned to the bus for the journey back to Darwin, we arrived at about 21.00 on Christmas eve, surprisingly the hotel restaurant and bar were closed so we headed to bed looking forward to turning off the alarm and sleeping in. We woke up on Christmas morning and although we were pleased to discover that the sun does rise in Darwin we left the curtains drawn, turned the aircon down to chill and listened to Carols from Kings College on the laptop while we opened our Christmas cards, some real, some electronic (thanks folks!). Sadly as soon as we opened the curtains and the sun shone in the illusion was broken. Our booking for Christmas lunch at the Hilton Doubletree had been confirmed so we put on our glad rags, called a taxi and headed off to celebrate. Christmas lunch at the Doubletree was a buffet hosted in the ballroom. We accepted a glass of sparkling wine as we arrived and were shown to our table, the waiter topped up our glasses a couple of time and then brought a whole bottle to the table in an ice bucket and left us to look after ourselves. Seafood is a popular part of Christmas in Australia and the buffet offered plenty to choose from, we started with oysters and king prawns before moving on to turkey, ham, beef, cauliflower cheese and roast potatoes, carrots and pumpkin. It was very nice but not really Christmas lunch – no bread sauce or stuffing in sight. Desert was very impressive, there was a long table groaning with patisserie including a 6ft chocolate yule log and a huge baked Alaska standing about 4ft tall. Mark even found a trifle so his Christmas was complete. After lunch we decided to walk back to our hotel along the Esplanade, it was very hot but it was good to walk of some of the excess. The rest of our time in Darwin was dictated by the weather which alternated between heavy rain (it is monsoon season) and very hot and steamy. We got out several times to have a walk and explore – it is only a small place. It is well designed for the climate with plenty of shade from rain and sun. When it rained we took the chance to catch up with our laundry and did some admin for the rest of our trip getting visa’s for Sri Lanka and sorting out baggage allowances on some of our flights. Our flight to Bali was due to leave just after 20.00 on Wednesday night, to pass the time after we checked out of the hotel we went to the cinema to see Red Dog: True Blue, the sequel to Red Dog, one of our favourite films. True Blue was released on boxing day and is set on a cattle station in the outback so it seemed a good way to spend our last afternoon in Australia. Finally, we caught the shuttle to the airport and checked in for our flight to Bali ready for the next chapter in our big adventure. Boxing Day in Cambridge: tour of Wicken Fen, had to wade through mud on nature trail, wrestle with huge reeds on butterfly trail, admired ancient grafiti on walls of fen cottage outside loo, lastly forced ourselves to try the local delicacy of cheese scones – hard life here about. Happy new year buddies! Happy New Year to you too. We have just relocated to Ubud, new hotel to explore. First big decision, which of the two pools to choose for a cooling swim.